Elmo was on hand to help launch the new area last Thursday during a special event. Scroll down for video of our exclusive interview with Elmo and more photos and videos from the event. 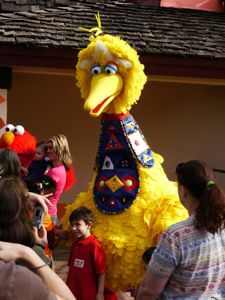 “Only at Busch Gardens can you meet versions of the Sesame Street characters in unique African-inspired costumes and have experiences with them you can’t find anywhere else,” says Jim Dean, Busch Gardens’ executive vice president and general manager. In addition to the rides and play areas, families can watch their favorite characters on the big screen. “Lights, Camera, Imagination!” runs daily in the park’s 4-D theater, located in Timbuktu. The movie features Elmo, Cookie Monster, Big Bird and other lovable Sesame Street characters trying to save the Sesame Street Film Festival. Their adventures are brought to life with 4-D gags and some new special effects. Families can share breakfast or lunch with Elmo and friends on select days at an outdoor dining facility. Sesame Street fans can also celebrate their birthdays in Safari of Fun. The parities can include Dine with Elmo to an exclusive party for a group from 20 to 50 that includes front of the line access to Air Grover and reserved seating for the daily show. Special event dines are offered throughout the year, too. From celebrating moms to Muppets, there’s a party each month to celebrate characters’ birthdays as well as holidays. 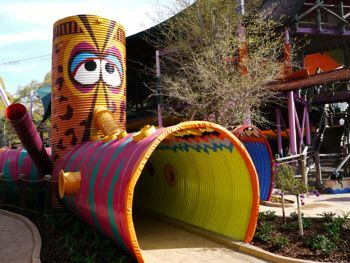 To hep celebrate the new kids play area, Busch Gardens is offering a free Preschool Pass, available only at SesameStreetSafariofFun.com. 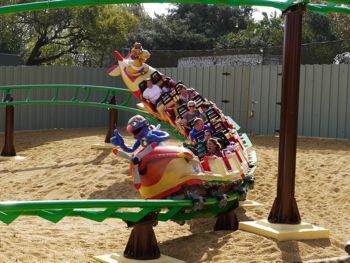 It’s exclusively for Florida residents with kids ages 5 and younger and is valid for unlimited admission through Dec. 31, 2010 at Busch Gardens Tampa Bay. The Preschool Pass does not include parking or Premium Passport discounts and benefits. Air Grover: A junior coaster with turns and mini-dives. Parents and kids can ride together. The Count’s Zambezi Rally: A kid-size car ride that goes on a jaunt through desert and tribal trails. Zoe-patra & the Hippos of the Nile: A splashy flume ride through the famed river. Must be between 36 and 56 inches tall. Snuffy’s Elephant Romp: Fly around and around and up and down on Snuffy’s fun elephant friends. Elmo’s Safari Go-Round: A tribal-inspired carousel with Elmo and his friends. Rosita’s Djembe Fly-Away: A swing ride through the jungle that sends kids whirling above the African canopy. Big Bird’s Whirly Birdie: It’s funny side up on Big Bird’s delightfully playful Ferris wheel ride. Telly’s Jungle Jam: Explore sounds, shapes and shadows in this naturally engaging play area for kids of all abilities. Elmo’s Treehouse Trek: A three-story hideaway to play hide-n-seek, discover new levels of fun and get a bird’s eye view of the entire play land. Cookie Monster’s Canopy Crawl: Climb, crawl and explore this three-story net climb. 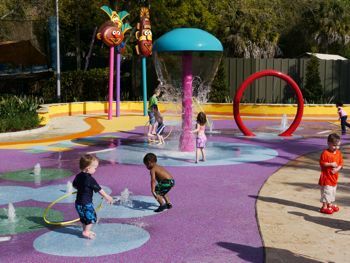 Slimey’s Sahara Sand: A fun-filled, sand-filled area where kids can frolic in the coolest desert around. Oscar’s Swamp Stomp: Stomp, splash and play in Oscar’s delightfully cool water play area. Bert & Ernie’s Watering Hole: A fun water adventure filled with bubblers, geysers, jets, dumping buckets and more. Sunny Day Theater: Musical performances bring tales of adventure to life. 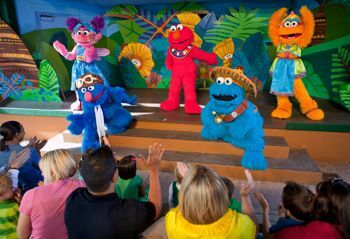 Now featuring: “A is for Africa,” an approximately 15-minute stage show starring Elmo, Abby, Zoe, Grover and Cookie Monster presented several times daily, followed by a character meet and greet. Sesame Street presents “Lights, Camera, Imagination!”: Playing in Timbuktu’s 4D theater, this new movie features Elmo, Cookie Monster, Big Bird and other Sesame Street characters trying to save the Sesame Street Film Festival. Dine with Elmo and Friends: Share breakfast or lunch with Elmo and his friends on select days at an outdoor dining facility. Breakfast is $18 for adults and $15 for children; lunch is $23 for adults and $17 for children. Breakfast and lunch prices include one free 6×8 photo per family. Snack-n-Getti Tribal Treats: Take time for all kinds of tasty treats to keep your energy up for more adventures. Abby Cadabby’s Treasure Hut: A bazaar of unique items, including tons of safari treasures. Buy some gifts you can’t find any place else. Cookie Monster’s Trading Post: Looks like Cookie Monster’s cravings have gone beyond sweets. Check out his trading post full of safari-inspired fun gifts. Air Grover Ride Photos: Take home a photo of your ride on Air Grover. Big Bird’s 123-Smile with Me: Sesame Street characters are here to meet and greet, share a laugh, a hug – and a photo. Interview with Sesame Street executive and overall look at the area. A ride on Air Grover. 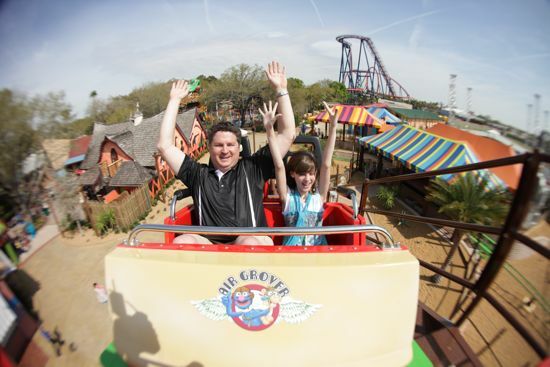 Interview with Mark Rose of Busch Gardens.